Blackcat Quiltings: Bound and Washed. Oliver's quilt is now bound and washed and ready to be posted once his mum and dad get back from a holiday. Not very good photography sorry but didn't notice that till now!! I'm really pleased with how it all came together. Don't you love the way washing a quilt makes it soft and crinkly. This is a really cool quilt!! Clever quilting - I love this quilt - bet Oliver does too!! I scrolled to the post with the book pattern/inspiration for your quilt. I think it is awesome and your quilting is just a great frosting on this sweet quilt. Thank you for linking up to Lets Book It. Thank you for writing to tell me you made this! I love how you personalized it with your quilting. Beautiful! This makes me happy to see. 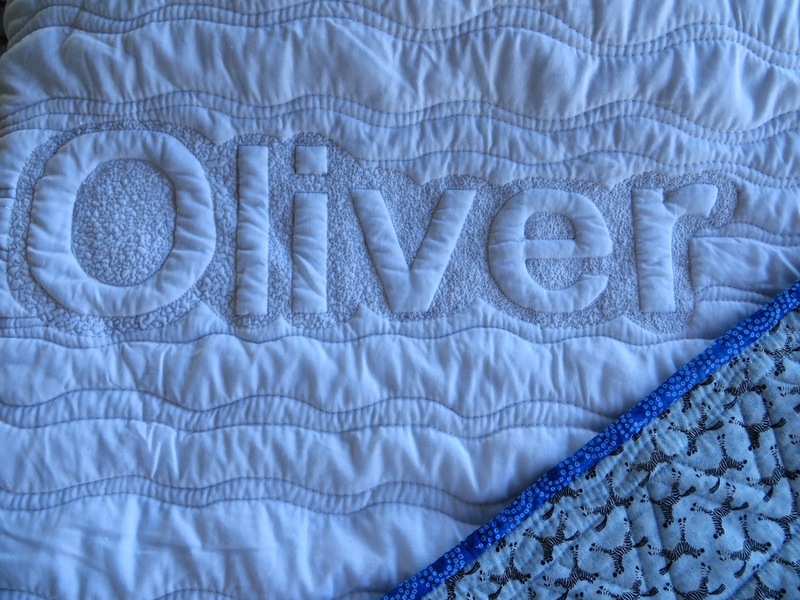 Oliver's quilt is such a fun one! I really like the name in the quilting. Quilt photography is challenging. Yours shows the quilting really well. Making is name stand out like that is awesome... something I might try at some point. I look forward to seeing what you do next.